and often hold them between my fingers when thinking about my sweet children. " to parents and children who have a family member die." about how much these charms mean to them." If you work for a hospital, a hospice, or an organization that would like to offer my charms to your families, I will provide you with Impression Kits to keep on hand. You do not prepay; your organization or the families are charged when I make the charms. If you'd like to discuss providing this service to your familes, please call or email me: 703-473-0 967, Anne.Moriarty@RegaliJewelry.com. The Impression Kits hold the actual silver clay which goes into my kiln. So the charms the family members get back are where their loved one’s finger touched. The clay shrinks approximately 10% in the kiln, so the finished charms are slightly smaller than what you send to me. 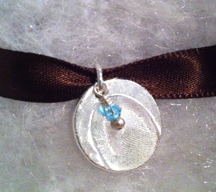 The charms are 99.9% silver, so they do not tarnish. Each one comes on a Sterling silver jump ring, so they can be put onto a necklace or bracelet. I stamp 1-4 characters on the back (numbers, letters, heart, cross, awareness ribbon), and each one is accented with a crystal (typically the birthstone of the patient). Each is packaged in its own box. I try to process charms from hospitals within 3 days of receipt, as I know that in most cases the families are grieving and will want the charms as a small source of comfort. Charms cost $44.50 each. This is a discount of 15% off my retail prices. If you want other pieces of jewelry, those are discounted 15% as well. See a full list of charm prices here. About half of the charms are sent back to the hospital, either because the patient is still there or the hospital wants to deliver the charms. But I also frequently send the charms directly to the family. Infants and small children do not have lines on their fingers yet. So in those cases the family receives casts of their tiny fingers, not actual prints. It’s a meaningful & healing time for some families to help to press the child’s digit into the clay. If this is the case, if you note which family member made which charm, I can keep them separate and note which is which on the box for the final charms. 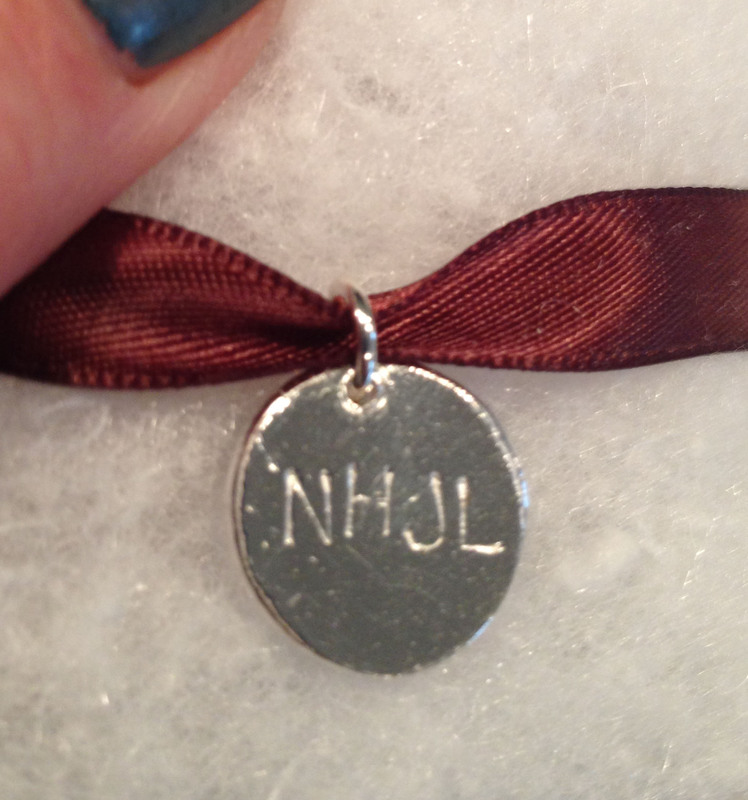 Thank you to the organizations who have partnered with me to offer memorial charms to their families. Click here for a list of some of these partners. near their heart. Thank you so much for your beautiful work." as I grieve the death of my sweet boy." Call Anne today on 703-473-0967 or fill out the form below and I'll contact you.